You get a large magnetic tactics board (600 mm x 900 mm) incl. 36 colored magnet and a wipeable board marker + wipe support. The board is fitted with 2 brackets, with which they can easily be attached to the wall. On the provided shelf, the accessories can be stored. Dimensions of the board: 600 mm x 900 mm. 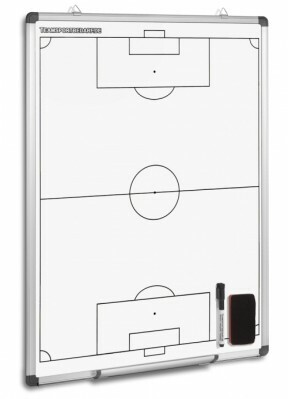 Achieving your tactical goals will be much easier with this magnetic tactics board because every move can be displayed perfectly. Also professional trainers buy from us. Good luck with the tactics discussion!